The Heckler & Koch HK33 was developed following the success of the 7.62x59mm G3. The HK33 is essentially a G3 chambered for the 5.56mm x 45mm NATO cartridge and is usually fed from a 25 or 30 round magazine. Like its older brother, the G3, the HK33 comes in various configurations. It's believed that the Regiment uses/has used the HK33KA3 carbine variant for close protection (body guarding) duties, usually keeping the rifle in the vehicles. The HK33KA3 features a retractable stock and a shorter barrel than the full-sized version. HK33A2 with fixed stock and Trijicon Compact ACOG scope. The HK53 is essentially a cut-down HK33. It features an 8.3 inch barrel, and a MP5-style forearm. 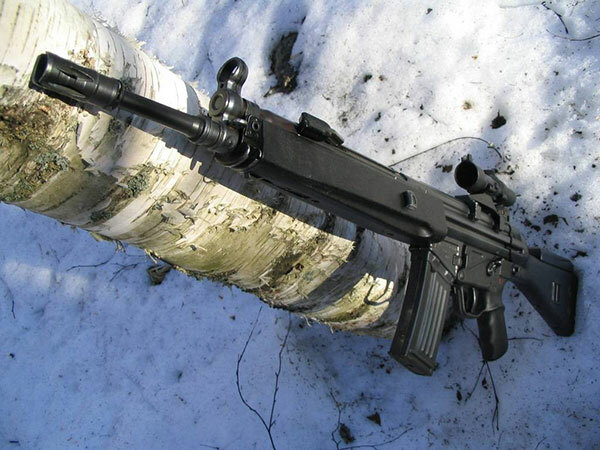 The HK53A3 version features a retractable buttstock. Chambered in 5.56mm x 45mm NATO, the HK53 packs a substantially heavier punch than the 9mm MP5 without being much bigger. With the right clothing, the HK53A3 could be carried as a concealed weapon. The short barrel does, however, result in a reduced muzzle velocity and therefore a shorter effective range when compared with the HK33. The HK53 was also used by 14 Int (or 'Det') operators during The Troubles. Some Army Air Corps helicopter pilots carried a HK53 as their personal weapon while flying sorties in Northern Ireland. HK53s were also employed by the various close protection (bodyguard) units within the British military, including Close Protection Unit Royal Military Police and Royal Marines Police Troop, and was eventually replaced by the C8 CQB carbine. 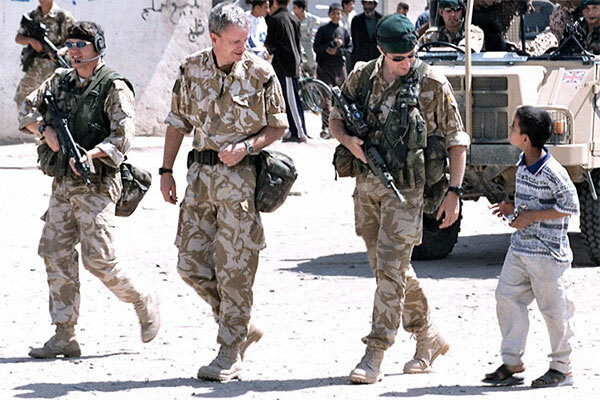 A close protection (CP) specialist with Royal Marine Police Troop (left) armed with a HK53A3, Iraq, 2003. The HK53a3 makes for a good weapon for CP duty. It has better stopping power than a 9mm sub machine gun but is small enough to be wielded in tight spaces e.g. getting in and out of vehicles or inside buildings.